InLoox PM Web App saves storage space and avoids duplicate records simultaneously, as the software works with smart file and object links. Save your documents conveniently on your file server, your SharePoint Server or on the online storage if you use InLoox now! 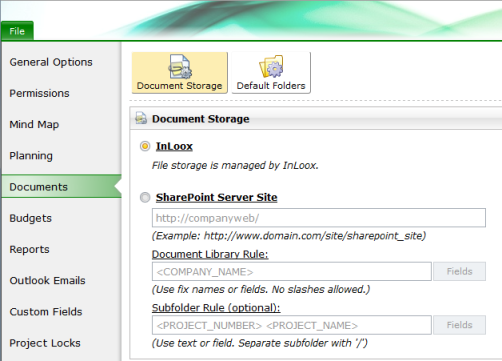 The option page Documents defines the rules for the InLoox PM file archiving feature. Some customizing options are available. The format of the project number affects the Document page. It is possible to update the contents of the project folder automatically. In the navigation pane click Documents. In Ribbon click Document store. Below you see the Document store area. Select File Server and click to add the folder you want. Select InLoox by using InLoox now! In this case InLoox managers all project documents. Base path: Path to a SharePoint server site, e.g. http://companyweb/ or http://www.my-sharepoint.com/site_int/. Document library rule: Structure for creating SharePoint document libraries. A fixed text may be input (which causes all projects to use the same library) or a rule (see file server rule, above). Creating a separate SharePoint document library for each project has the advantage that the data access permissions can also be defined separately. Subfolder rule (optional): Path name within a SharePoint document library. If no text is input the master folder of the document library is assumed. If only one SharePoint document library is to be used, it is useful to apply a rule (see File Server, above), since otherwise the documents from all projects would be copied to the same folder. If no projects are yet on file, changing these parameters has no effect. New projects or projects for which no document folders exist are managed automatically according to the changed parameters. Existing projects are managed with the existing document folder until the user changes this manually. Determine the document folder path - InLoox • Copyright 1999-2019 © InLoox GmbH. Reservados todos los derechos.